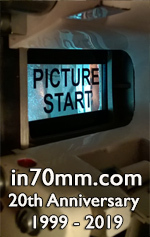 International 70mm Publishers in The Netherlands has taken the initiative to create a new Award for those people who have worked for many, many years promoting and researching the heritage of 70mm film and original Cinerama and have never received any official recognition. 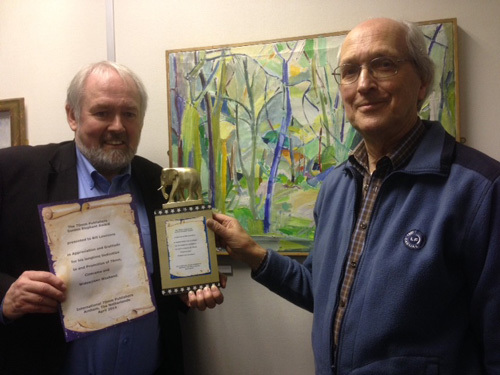 In cooperation with a committee of advisors consisting of Mark Lyndon, Tom March and Nigel Wolland they have presented their first Award during the Widescreen Weekend 10-13 April in Bradford, UK to David Strohmaier from Los Angeles who has attended the Weekend on many occasions. 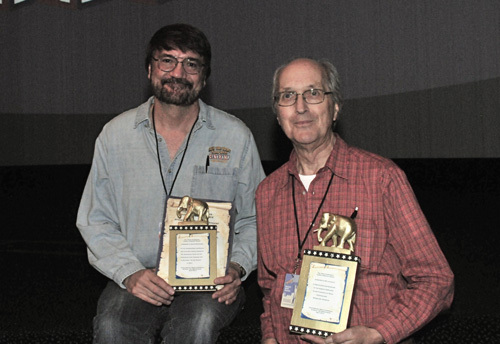 The 70mm Publishers Golden Elephant Award presented to David Strohmaier for his Outstanding Contribution and Cinerama History Research, his Restoration Work and for making the first Cinerama film in 50 years: "In the Picture" in 2012. International 70mm Publishers April 2014. Arnhem, The Netherlands. If David Strohmaier had not done his extensive research on the Cinerama process, it would have been completely forgotten! On Tuesday April 15, a second Award was presented to the former programmer of the Widescreen Weekend, Bill Lawrence in his office in Halifax, UK. In 1993 Bill started this 70mm and Cinerama Widescreen Weekend after they had installed the very unique Cinerama projection equipment in the National Media Museum's Pictureville Theatre. The first program was a festival of famous classic movies. Among them was a 3-strip “This is Cinerama” print, 70mm prints of “Lawrence of Arabia” , “2001: A Space Odyssey” and a 70mm blow-up of “The Sheltering Sky”. Guest of honour was producer Jeremy Thomas who talked about his work for “The Last Emperor” and the 70mm production of “Little Buddha”, which was nearly finished and released in 1994. The 70mm Publishers Golden Elephant Award presented to Bill Lawrence in Appreciation and Gratitude for his longtime Dedication to, and Promotion of 70mm, Cinerama and Widescreen Weekend. International 70mm Publishers April 2014. Arnhem, The Netherlands. 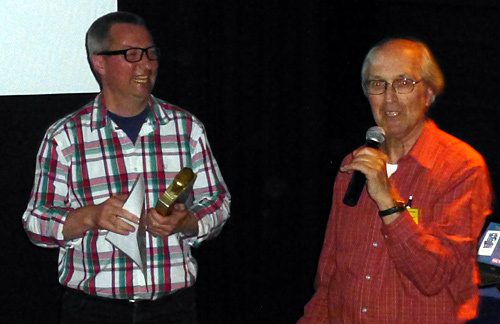 On April 26, during the celebration of the 25th Anniversary of the Biffen 70mm Cinema in Aalborg, Danemark, a third Award was presented to Thomas Hauerslev, for his work on the in70mm.com website.